Brooklyn Digest: Didi To Have Tommy John Surgery; Will Machado Finally Become A Yankee? Didi To Have Tommy John Surgery; Will Machado Finally Become A Yankee? 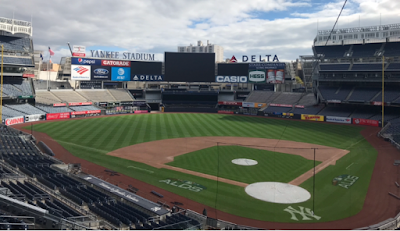 Yankee Stadium on Friday morning. Photo by Jason Schott. The Yankees season ended on Tuesday night when they lost to the Boston Red Sox in the ALDS. The Yankees won 100 games in the regular season, then beat the Oakland A's in the one-game Wild Card playoff before losing to Boston in four games. 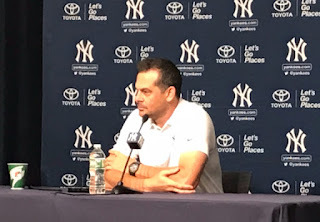 Yankees Manager Aaron Boone and General Manager Brian Cashman held their farewell press conferences on Friday afternoon at Yankee Stadium. Boone went first, and after discussing his decisions in the playoffs, what he learned in his first year as Yankees Manager, and the potential of his offense, Yankees Public Relations Director Jason Zillo dropped a bombshell 36 minutes into his press conference. 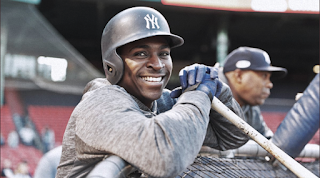 Yankees shortstop Didi Gregorius had an MRI on Thursday on his elbow will be having Tommy John surgery on his throwing arm, and is expected to be out until sometime next summer. The Yankees are still determining when he will have the surgery. "We think it happened at Fenway on a ball of the Green Monster that he went out and got and threw in," Boone said to the question of when the injury occurred. "It's the right arm. Whether it was game one or two, I'm not even sure. He felt something then, just kind of being the player as tough as he is, as non-dramatic as he is, just kind of played with it the final two days (of the ALDS against Boston). "He had the MRI and it revealed a tear, so he'll have that. We're optimistic that he'll be back at some point during the season. I don't want to speculate on when, it's obviously different than a pitcher, he's not coming back on the mound, so we think there's a realistic chance that he plays the bulk of the season with us, but that's obviously if surgery's next week, we'll know a lot more after the surgery as far as a timeline goes. We are optimistic that he'll play a lot of the season with us." 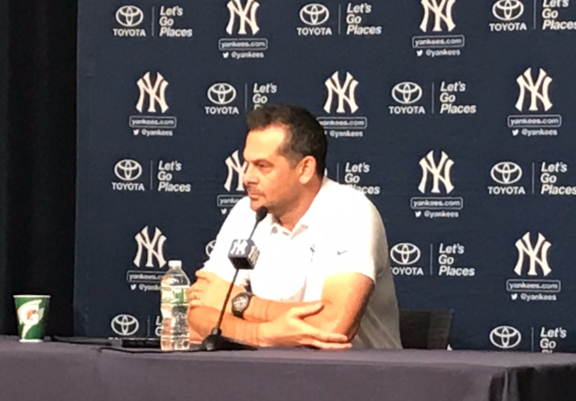 Yankees Manager Aaron Boone on Friday afternoon. Photo by Jason Schott,. This is a major loss to the Yankees, as Gregorius has been a solid player ever since they acquired him from Arizona ahead of the 2015 season to take over for Derek Jeter. The best left-handed bat in the Yankees lineup, Gregorius had a career-high 27 home runs this season, after he hit 25 in 2017, with 86 RBI, while hitting .268 with a .335 on-base percentage and a .494 slugging percentage. Didi Gregorius during the ALDS. @Yankees. Cashman said of when he found out about it and how it will affect his offseason planning, "He tweaked it during the Red Sox series. We seemed to have a lot going on during that series. On a throw, he felt it before he got back here to Yankee Stadium, and clearly he just got checked out yesterday by our doctor, went through the MRI exam, and it revealed that he needs Tommy John surgery, unfortunately, on his throwing arm. It's certainly tough news, no question. "Didi's a great player, he's an important player for us, and we're going to be without his abilities for a period of time until sometime next summer, and so right now, hey, what you've got to do is, he'll be in great hands, hopefully have a great surgery and we all know he'll do everything necessary and appropriate to get back on track and it's our job to hold the fort until he does. We feel he's a special player and it's certainly not like you ever want any of your guys getting hurt." One internal candidate to replace Gregorius would be Gleyber Torres, who had an incredible rookie season playing primarily at second base. In 123 games, Torres hit .271, with a .340 on-base percentage and a .480 slugging percentage, with 24 home runs and 77 RBI. Boone said of Torres, who is primarily a second baseman being a full-time or emergency shortstop with Didi out, "Either. The offseason will unfold, what's our roster look like, who's our personnel, will determine that. "I think Gleyber Torres is very capable of being an everyday shortstop. Obviously, we love him at second, but those will be decisions that become more clear over the next few months as our roster shakes out and who we have, are we in a stopgap situation, those kinds of things that would be hard to predict at this point. We feel Gleyber would be capable in an everyday role or, like he did this year, when he moves over and spells a guy from time to time." One obvious option for the Yankees to fill shortstop is for the Yankees to sign a player they have coveted for years, Manny Machado, the long-time Baltimore Oriole who was traded to the Los Angeles Dodgers this past July. Machado is a free agent after this season, and likely to warrant a contract in the neighborhood of 10 years and $300 million. One option the Yankees can use to acquire Machado to keep them under the luxury-tax threshold of $206 million is to do is a sign-and-trade with the Dodgers and sent outfielder Giancarlo Stanton, a California native, to his hometown team. Stanton was abysmal in the playoffs against the Red Sox, and with nine years left on his 13-year, $325 million contract, it might make some sense for the Yankees to move him before he becomes the albatross that Alex Rodriguez became. Stanton will be 29 on November 8, so his contract will run just before his 39th birthday, whereas Machado turned 26 this past July, so to get a player three years younger who can fill an immediate need might make some sense. In his first year in pinstripes, Stanton hit .266 with 38 home runs and 100 RBI, .343 on-base percentage, and .509 slugging percentage, with 70 walks and a high 211 strikeouts. Machado played in 162 games (96 for Baltimore, 66 for the Dodgers), and he hit .297 with 37 home runs and 107 RBI, a .367 on-base percentage, and a .538 slugging percentage, with 70 walks and 104 strikeouts. In looking at the numbers, Machado has the edge in many categories, and less than half the number of strikeouts (104) that Stanton (211) had this season. The Dodgers likely will not re-sign him because they will have Corey Seager coming back, and they could have an opening in the outfield for Stanton. Gregorius will be a free agent at the end of 2019, so if the Yankees pull the trigger on acquiring Machado, his days in pinstripes could be near its end. Cashman said of whether he sees himself going outside the organization to replace Gregorius, "We're going to do what we always do. Unfortunately, our season is over, so it's time to schedule the pro scouting meetings and preparing for those, we've already got those scheduled, and sooner than we wanted to, obviously. We'll go through our process, evaluate the available free agent market, and then engage other clubs about what's available trade-wise, and then weigh all of that information against what we have internally. This isn't regarding the Didi situation, just regarding the landscape. It's been a very healthy process that we run through every year that we do to set up the winter program. It'll take us wherever it takes us, so we'll be in a better position to evaluate any outside opportunities via trade or free agency, various, whether it's pitching or position player and we'll factor it all in. Internally, Torres is by far the best player under consideration that we have and he could play short, he could play second, so we'll see." Cashman said of planning for next season as if Didi won't be here due to the unknown of the surgery, "I think we'll plan, as we always try to do, even though it might not manifest itself out at times. I think we'll plan to improve this club in any way, shape, or form we can, whether it's an everyday player, whether it's an insurance policy. I use the example of how we acquired (Adeiny) Hechavarria towards the end of the deadline. It wasn't for any reason other than the fact that, hey, here's an available player and he's better than what we already have and we can fit him in, and if there's ever an injury, which there wasn't, he can play a role for us. We lost Didi for a short period of time (due to a wrist injury in late September). We saw a chance to upgrade and the cost was correct, so we did it, so we going to approach this winter no different than any other winter and try to do the same if we match up with an agent and a player on free agency, if we match up with a team on the trade front, and measuring against what we already have and what we have to give up, whether it's financial or player-wise in a trade, hat's what we'll do and we'll evaluate it. We do thankfully have internal options, but the best option is Didi, and unfortunately for a period of time, he's got to take care of his health and he'll get the best care, and we'll wait on him, and how we handle the waiting, and we're in a pretty unsure situation right now, is still to be determined." The Yankees stayed under the luxury-tax threshold this season, and Cashman said of whether Owner Hal Steinbrenner would be open to going over it next season to get a player like Machado, "We haven't started our winter program yet. Obviously, I would just go back to my previous answer. We'll wait for our pro scouting meetings, and Hal Steinbrenner will be provided with all information that stems from that, and then he'll direct us, as he always does, on the financial level. We'll evaluate all available options, certainly not in a position to talk about players in free agency regardless, and again, we're going to get our shortstop back at some point, so again, all of this is to be determined, essentially the question is how do we react to this information and we'll either stay with what we got, reinforce the alternatives, you know, Aaron Boone has some choices, and we can obviously pursue something stronger. It's just, we're too early in the process to even have any strategies mapped out and I don't know what the budgets will be. I think we navigated a lot of different things this year in a very successful way financially, and we'll continue to try to do the best we can, as always. Ownership's always very strongly supporting this franchise, and I don't see that ever changing, so we'll see." Cashman said of any other players that might need surgery in the offseason, "Thankfully, it appears that we do not have anybody - CC (Sabathia) had surgery today. Again, Dr. Chris Ahmad was busy yesterday, went through a bunch of guys that had complaints and whether MRIs or X-rays or what have you, to make sure it's 'all clear.' We have an 'all clear' on all except CC, who had a repeat of the knee surgery he had last year, and Didi's unfortunate result of his MRI. But, going forward,as of right now, unless something new develops that we're not aware of, everybody else was cleared."